To keep your family healthy, it is important to maintain clean air within your home. 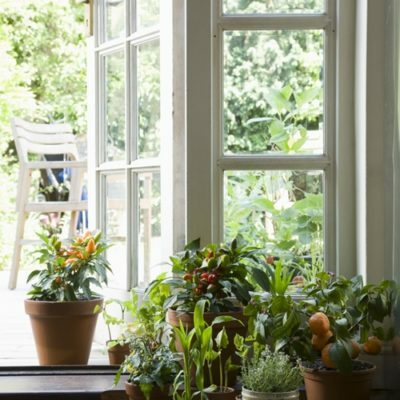 In addition to using air purifiers, check out these nine plants that will help you breathe easier in your house. According to Mother Nature Network, this plant can help clear the air of elements associated with chemical cleaning products, like benzene and formaldehyde. Since aloe vera thrives in the sun, your best bet for keeping this plant healthy is by placing it on a windowsill. The gel found inside aloe helps soothe minor burns and keeps your skin soft. According to The Huffington Post, this plant is easy to grow and maintain. It flourishes in medium sunlight and warm temperatures and can be displayed hanging or on the floor. The National Aeronautics and Space Administration lists it as the best choice for absorbing formaldehyde fumes. Do you lack a green thumb? Then this strong and resilient specimen is perfect for you. Also known as chlorophytum comosum, this plant works to eliminate traces of benzene, xylene, carbon monoxide and formaldehyde from the air. According to Mother Nature Network, the spider plant is also safe for pets. Keep these plants in the shade while giving them plenty of water and in return they will cleanse your air of trichloroethylene and benzene. According to The Huffington Post, these elegant plants have a high score of 8.4 on NASA’s air-purifying scale. For something that not only absorbs toxins, but also adds a pop of color to your room, Mother Nature Network suggests this bright flower. It is ideal for cleansing your home of chemicals found in dry-cleaning materials and ink, so try placing it in your office or bedroom as long as these spaces provide it with plenty of light. If you are looking for something a little out of the ordinary, this uniquely beautiful plant is perfect for you. It features deep green leaves edged in a light red and can grow as high as 15 feet, reports The Huffington Post. Place this plant in the sun and it will work to eradicate xylene, formaldehyde and trichloroethylene from the air. Another beautiful floral option, this blossom helps get rid of the chemicals that enter the air from glue, plastic, paint and laundry detergent. Also known as Devil’s ivy, this hanging plant retains its bright green color even when kept in the dark. According to Mother Nature Network, golden pothos helps absorb toxins caused by car exhaust and is a great way to improve the air quality of your garage. This plant, which features leaves of light to bright green, eventually grows beautiful red berries. Additionally, it clears the air of a multitude of harmful toxins, reports Mother Nature Network. The longer this plant lives, the more it absorbs.